When will I get my order? : Orders take 1 week to process; add ship time from NY. View this map (Click here for map) to calculate shipping time. 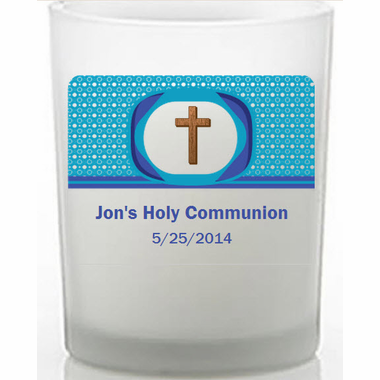 Here are some cheap First Communion favors for boys that your guests will enjoy. Giving personalized candles has never been easier when you create your personalized sticker in our online designer program and apply the clear stickers to the votive candle. Decorate place settings and event tables with them and they'll admire your creativity. We created these custom candle favors to accomodate our customers seeking festive and colorful design choices to make their favors unique to their occasion. The custom printed stickers allow for multiple color choices not available on silkscreen imprint items. 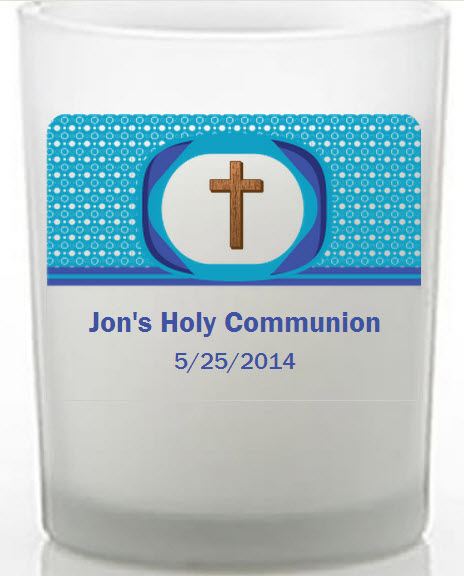 Each frosted glass with a poured candle measures 2.5" tall x 2" in diameter. With each candle comes a clear sticker with your custom information on it for you to apply. They can be affixed easily from peel-off sheets and measure 2 .5" x 1.75". This candle comes bulked packed and is not in any presentation packaging.